Jarjums Life Museum – a museum where you won’t see dinosaurs, butterflies, king’s crowns or queen’s capes. It is a museum that has been made by children – Aboriginal and Torres Strait Islander Jarjums. Intertwining exploration, visual arts, storytelling, photography, soundscapes and culture, Jarjums Life Museum is a collection of original works documenting the lives of these Jarjums – their here and now and what life is like growing up today. 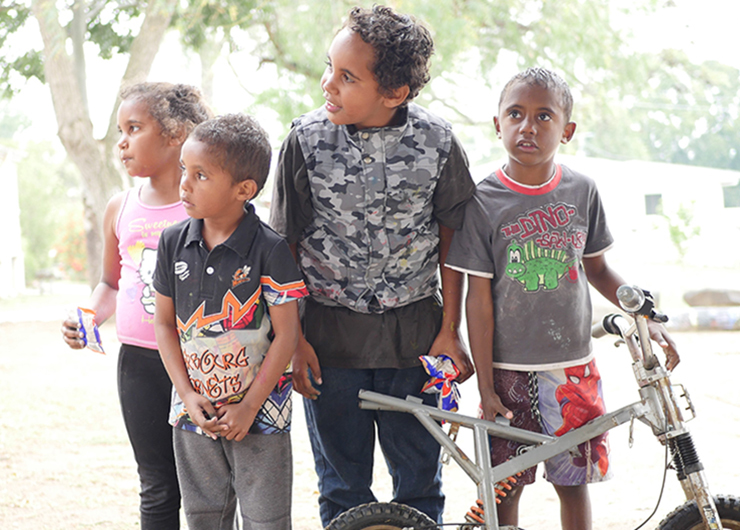 Come along and explore the experiences, ideas and dreams of two distinct communities – the coastal mob of Minjerribah – North Stradbroke Island and the urban mob of Hymba Yumba Community Place. Image: Sullivan Kids (Summer, Roland, Gene and Corey-Jack) 2016. Photography by Libby Hayward. Courtesy of Jarjums Life Museum.